Students of Koshigaya Campus spend their academic life by using well prepared facilities, while enjoying their campus life in the rich, natural environment of the Musashino Plain from season to season. A river named Moto-Aarakawa slowly flows just in front of the campus. Every spring, a row of cherries adorns the riverbank with pale pink blossoms. Also at Hisaizu Shrine, a historic Shinto shrine nearby, wisteria bloom with little light purple flowers. Transportation from central Tokyo to Koshigaya is quite accessible. From Koshigaya, if you take a train from the nearest Tobu Skytree-Line “Kita-Koshigaya” station, it directly brings you to the Tokyo metropolitan area. Moreover, it connects directly to the Tokyo Metro “Hibiya-Line” subway and the “Hanzomon-Line”. Around the “Kita-Koshigaya” station, supermarkets and convenience stores abound, so it is easy to shop for necessities for daily life. Restaurants for casual lunch and play spots are also there. On campus starting from Building 3 which boasts the latest learning facilities, the environment for study is fully equipped. There is a bright and spaciously built dining hall and an open-shelf library. 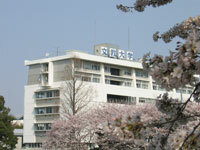 Bunkyo University’s 40-year-long history and tradition have been created on this Koshigaya Campus. Currently, nearly 4,900 students of three faculties: Faculty of Education, Faculty of Human Sciences and Faculty of Language and Literature. Always energetic for their study and club activities, Koshigaya Campus is filled with busy students. From the early days, the university has been trying to expand educational facilities on Koshigaya Campus, so we offer high-quality research and study environment to students. Building 3 is the base of campus life. In this seven-story building, personal computer room, CALL (Computer Assisted Language Learning) classroom and faculty laboratories are applied. Some of the university administrative offices such as Student Support Office and Career Support Office are stationed here as well. There are other kinds of facilities of various functions on campus, too. Building 13 has a large classroom used for a meeting hall, the Library contains 350, 000 volumes of books. The dining hall, not only serves meals but is also utilized for student’s mutual exchanges. Ranging from Building 3 with the Personal Computer Room and CALL classroom to Building13, Koshigaya Campus’s classrooms provide a comfortable study and research environment for students. 350,000 volumes of books, CDs and DVDs are widely stored. Rare collections of books on Percy Bysshe Shelley, an English Romantic poet, and the Chinese Writings Collection, which include early editions of “Records of the Grand Historian”, are the pride of its catalogue. 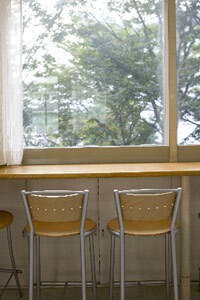 As Koshigaya Library’s motto is “ a library open to everyone ”, people outside the university are also welcomed. An athletic field used for classes and athletic club activities. A piano is installed in each chamber. It can be used for free practice by reservation in advance. Students can enjoy well-balanced, nourishing meals in a bright, and expansive dining hall. Musical techniques like composition, arrangement and solfeggio can be learned at the ML room with the latest musical education facilities.